Search and rescue, hurricane disaster relief and youth flight training: these are just a few of the efforts supported by Georgia Wing, Civil Air Patrol (CAP) in 3,040 hours of flight time for Georgia communities during the last year. For these and other efforts, Georgia Wing was honored this week with multiple awards reserved for some of the best and brightest in the country at Civil Air Patrol’s National Conference in Anaheim, Calif. These awards recognize members, wings (the state organizations) and units for service to the nation, their communities and to Civil Air Patrol. 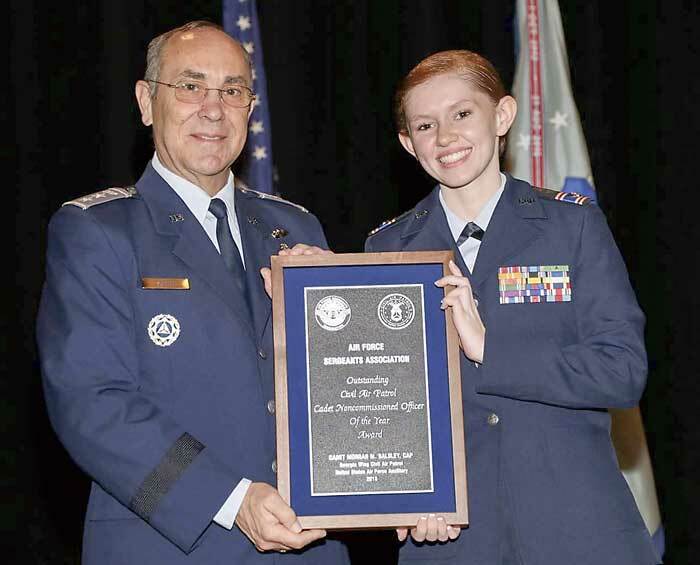 • Air Force Sergeants Association Cadet NCO of the Year: Cadet Chief Master Sgt. Morgan Balsley, Peachtree City Falcon Field. Last year, Georgia CAP flew 128 hours of sundown patrol along the Georgia Coast; 513 hours in cadet orientation rides and flight training; 480 hours of search and rescue and disaster relief training, and much more. Deployed to support FEMA’s post-hurricane efforts, Georgia CAP volunteers took over 30,000 aerial photographs to help document storm damage and assistance needs. The cadet program stands as a national benchmark of excellence in youth programs. The emphasis on leadership, character and ethics supports accomplishment well beyond CAP activities. Civil Air Patrol, the longtime all-volunteer U.S. Air Force auxiliary, is the newest member of the Air Force’s Total Force. In this role, CAP operates a fleet of 560 aircraft, performs 90 percent of continental U.S. inland search and rescue missions as tasked by the Air Force Rescue Coordination Center and is credited by the AFRCC with saving an average of 80 lives annually. This year, CAP celebrates 70 years of affiliation with the US Air Force as the official Air Force Auxiliary. CAP air and ground teams perform over 90% of inland search and rescue missions tasked by the Air Force Rescue Coordination Center, with 58,000 volunteers and 560 aircraft. CAP’s 57,000 members also perVisit www.GoCivilAirPatrol.com for more information.